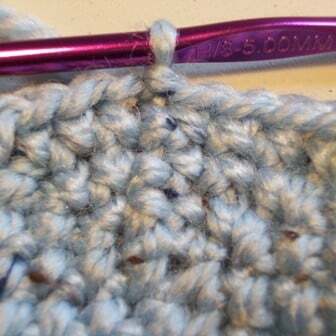 One of the downfalls in crochet is that you often end up with seams that are highly visible. 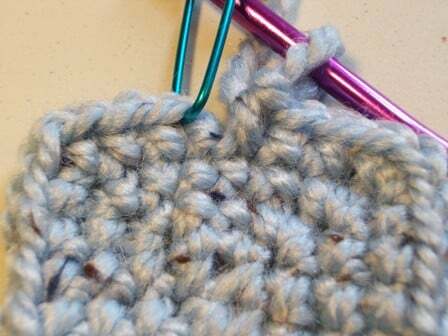 Sometimes they can distort your fabric by creating more space in the joining slip stitch and thus throw off the shape of the finished project. 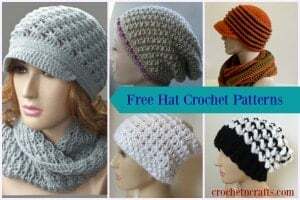 The joining slip stitch can also throw off the number of stitches in the round as it is often mistaken for another stitch in the previous round. 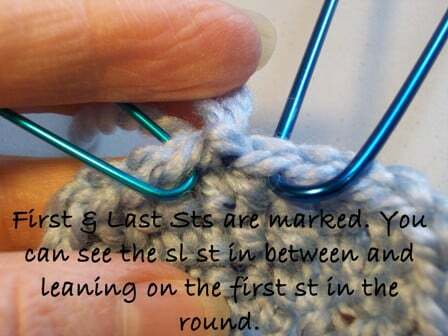 A stitch marker can help you to keep track of the last stitch in the round. My method of joining is quick and easy and will help you to avoid all of the above. Depending on the yarn you use, it can result in an almost seamless join. And this is what we want. I find with thinner yarns you still get a ridge, but with thicker and softer yarns it’s virtually invisible. My trick is simply to pull the active loop, the loop on the hook, as tight as I can before I pull the yarn through at the last step. 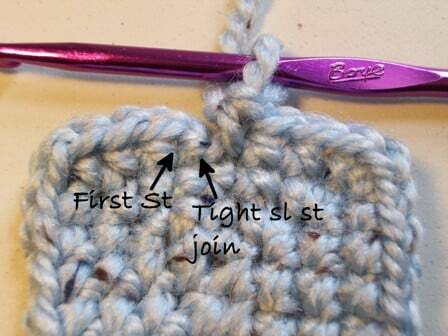 Hence for this tutorial I’m referring to it as the tight slip stitch join. If you don’t tighten the active loop on hook before making the join then you get what I call, for the sake of this tutorial, a loose join. This join creates a space between the first and last stitches in the round and causes your work to flare out more than what it should. For some projects it doesn’t matter if you join loosely, but generally you want to pull it tight because not doing so can distort the shape of your fabric. The distortion is not so much noticeable if you are working in a “Round” round as opposed to working in a “Rectangular” round. If working in a rectangular round, it can leave the joining end much wider and throw off the shaping of the finished project. 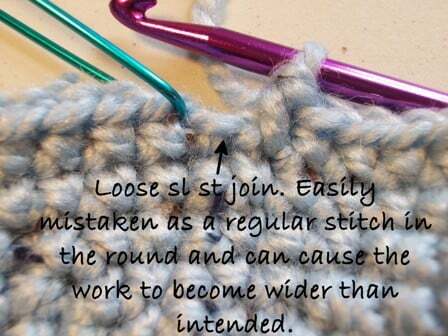 Another downfall of the loose join is that the slip stitch is easy to mistake for a regular stitch. If you’re not careful, you could easily end up with more stitches in each round. 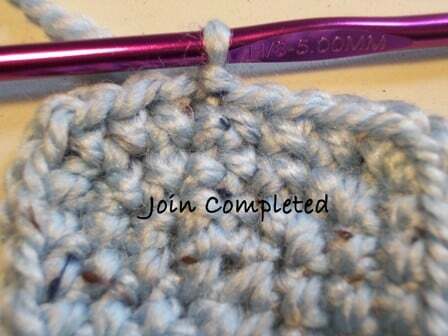 With the tight join, you won’t be able to work into that slip stitch even if you try. The image below shows what a loose join looks like. 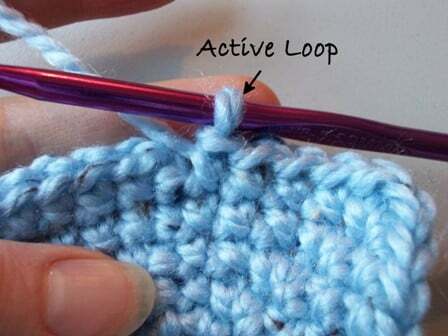 For beginners, this can be confusing because if you don’t look closely it looks like another stitch. And believe me, it’s very easy to throw another stitch in there. 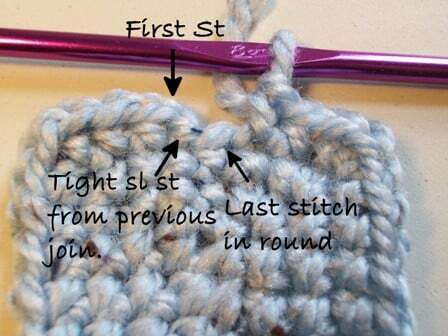 The image below shows what a tight join looks like just before you get to the last stitch. Notice the last stitch still needs to be worked, however, it looks similar to the image above where all the stitches have already been worked into. A View Before Last Stitch is Worked In Round. This is what it looks like after all stitches have been worked into when a tight join was made in the previous round. You can still see a hint of the joining slip stitch, but it is clear now that all stitches have been worked into. 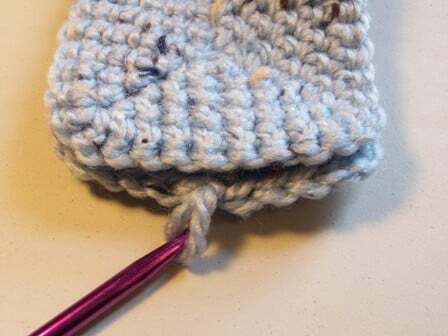 Place a stitch marker in the first and/or last stitches of the round to help keep track of how far to crochet and where to join each round. With the tight join, both ends come up even as you can see below. (The top part looks wider, but only because it is closer to the camera.) When joining loosely over several rounds the end where you make the join will begin to flare out and distort the fabric. 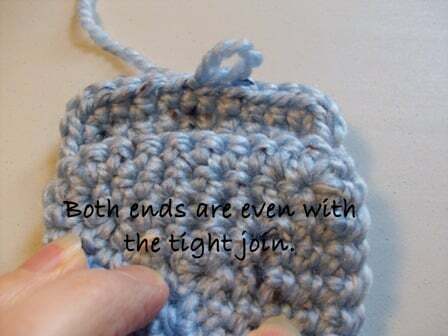 To make the tighter join, insert your hook into the first stitch as normal. 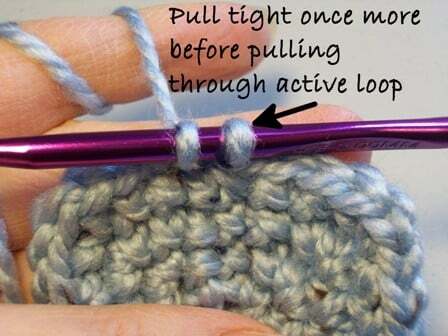 Pull the yarn tight in order to tighten the active loop on hook. Yarn over and pull through the fabric. 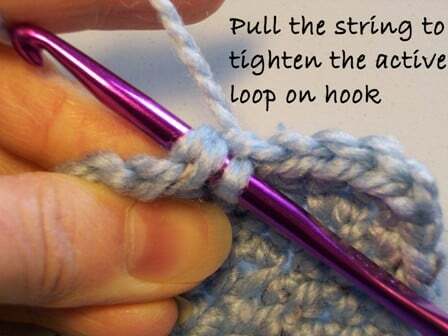 Then give it another firm tug and continue to pull tight as you pull the yarn through the active loop on the hook. Yarn Over and Pull Through, Then Tighten Once More Before Pulling Through Last Loop On Hook. After the join is completed you can see the slip stitch in between and is leaning on the first stitch in the round. After the next round is completed, the tight slip stitch becomes nearly invisible.